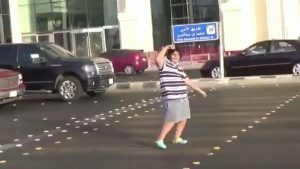 Police detained Tuesday a teenage boy who came under the spotlight after a video posted on social media showed him dancing on 1990s hit at a traffic light in the coastal city of Jeddah. Unnamed, the boy is accused of “improper public behavior” and “disturbance of traffic”. A 45-second video in which the boy donning striped t-shirt, grey sports shorts and brightly-colored shoes strides to the middle of a crosswalk and dancing to 1993 hit “Macarena” in front of lanes of cars at a traffic light went viral on social media over the weekend. The boy may be seriously penalized if found guilty in the ultra-conservative Saudi kingdom. The video sparked mixed comments with some hailing the boy’s bravery while others blame him of misconduct. The latest incident took place few days after police arrested and released early this month a Saudi singer for using the dab move in an onstage dance, al Jazeera reports. Abdallah al-Shahani appeared on a viral video dancing at a music festival in the city of Taif in southwestern Saudi Arabia. Last month, a young woman was detained then released without charge after she appeared in a video wearing a mini-skirt and walking in public. She caused public outrage for her “immodest clothes”. Reports say she was released without charge because the video was published without her knowledge. Posted by KanelkaTagba on Aug 23 2017. Filed under Gulf News, Headlines. You can follow any responses to this entry through the RSS 2.0. Both comments and pings are currently closed.